Prairie is an ecosystem dominated by grasses and wildflowers with few trees or shrubs. Prairie once covered the central 1/3 of North America from western Ohio to Texas to the Rockies. The eastern band of the prairie was the tallgrass or bluestem prairie. Prairie plants, with roots penetrating deep into the soil, are adapted to the midsummer droughts of this region. The Reserve's prairie plantings (on former farmland or pasture) represent this once-vast, nearly treeless ecosystem, of which less than 1% of the original remains intact. As of 2012, there are about 300 acres of prairie plantings at Shaw Nature Reserve, with more planned. 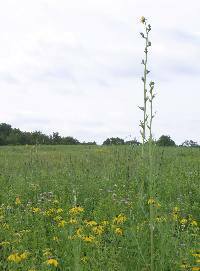 Prairie plants are introduced by direct seeding, and less often, greenhouse-grown transplants. The tall grasses, reaching as high as 10 feet into the sky, remind us of the ocean as they wave in a gentle breeze. Over 70 species of wildflowers bloom in the prairie beginning in May and ending in October. The leaves, stalks, and blossoms of these wildflowers present a fascinating variety of colors, shapes, and textures. Some species, such as goldenrods and sunflowers, spread across the prairie in bright yellow masses in late summer, while to discover other species may require more careful searching among the grasses. For hikers, the Prairie Trail originates at Brush Creek Trial, near #7 on the trail map, rises to an observation deck, then descends to the trail’s end point near the Gardenway Bus Stop, #14 on the trail map. The Reserve's prairie has moderate to gentle slopes with a grove of hickories and young post oaks on the north-facing portion nearest the Maritz Trail House, #8 on the trail map. The low area near Brush Creek contains many species of plants found in wet prairies. The observation deck provides an exhilarating view of the multicolored prairie and the surrounding rolling hills. From here one can picture the pioneer wagons winding through the tall grasses on their way to settle the new land. The Trail House Loop Road also winds through the prairie, from just past the West Bridge over Brush Creek to the Bus Stop and Wetland Trail head area.